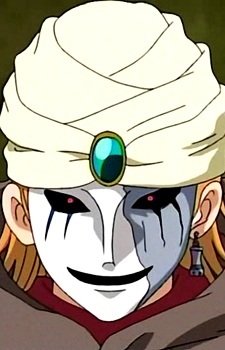 Alibaba is a rather arrogant Rook. He strongly believes rank doesn't symbolize strength, and thinks his is on par with the Knights. Alibaba is largely Arabian themed.Alibaba first appears during the 3rd Round of the War Games. He is the first to go up when Alan wants to go first, claiming the other Chess Pieces there are too weak to fight him and that victory will make him a Knight. Alibaba opens the battle by summoning his Guardian. Alibaba is no match for Alan, however, and the Guardian is quickly defeated. Alan then carries Alibaba into a volcano and throws him into it. In the manga, he dies from this. In the anime, however, Alibaba lives, as Phantom used one of his Dimension ÄRM to bring Alibaba to safety. Alibaba then hunts down and captures the Princess of Reginlief. Alibaba is defeated again, however, through the efforts of Ginta Toramizu, Jack, and Loco and apparently dies. Alibaba, who once again survived, reappears during the end credits of the final episodes, cheering up Fuugi while he cries over the Princess of Reginlief's marriage to Carl.